The Passover meal was the final meal of Jesus, with all his disciples, before the day of him being put on the Cross. It was celebrated in a small upstairs room. The bread and wine represents Christ’s body and blood, who died for us all. Jesus knew his fate that night when he passed out the bread and wine to the Apostles. We wish a Happy Easter to our wonderful patients and to your families. 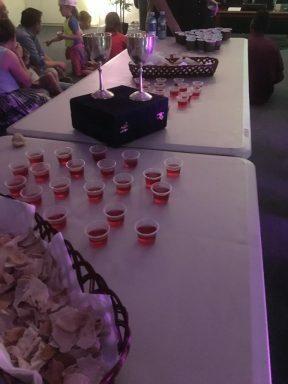 The first communion was celebrated simply. The photo is of a casual Passover meal at church to represent Jesus’ final meal as a free man. I would like to take the opportunity to thank all the staff that make Seymour Dental a great to place help people and quite simply make it work. I would be lost without them. Thanks to all the nurses Sue, Renee, Roni, Maggy, Sherwin, Nazli, and Samia, Saba & Georgy. Thanks Adam for the website “workings” and to Aisha for the Facebook and other media. Also I appreciate the care and assistance the dentists have made at the practice. Thanks to Dr Joy Liu, Dr Kim Nguyen, and Dr Mary Hatem. It’s always a time to reflect and to be thankful for what we have and the people in our lives. Life is too short!